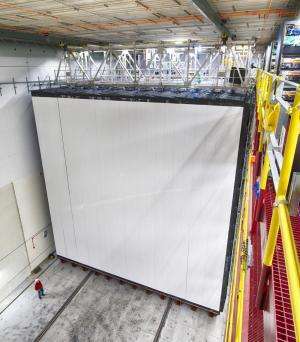 Using the first completed section of the NOvA neutrino detector, scientists have begun collecting data from cosmic rays—particles produced by a constant rain of atomic nuclei falling on the Earth's atmosphere from space. "It's taken years of hard work and close collaboration among universities, national laboratories and private companies to get to this point," said Pier Oddone, director of the Department of Energy's Fermi National Accelerator Laboratory. Fermilab manages the project to construct the detector. The active section of the detector, under construction in Ash River, Minn., is about 12 feet long, 15 feet wide and 20 feet tall. The full detector will measure more than 200 feet long, 50 feet wide and 50 feet tall. Scientists' goal for the completed detector is to use it to discover properties of mysterious fundamental particles called neutrinos. Neutrinos are as abundant as cosmic rays in the atmosphere, but they have barely any mass and interact much more rarely with other matter. Many of the neutrinos around today are thought to have originated in the big bang. "The more we know about neutrinos, the more we know about the early universe and about how our world works at its most basic level," said NOvA co-spokesperson Gary Feldman of Harvard University. Later this year, Fermilab, outside of Chicago, will start sending a beam of neutrinos 500 miles through the earth to the NOvA detector near the Canadian border. When a neutrino interacts in the NOvA detector, the particles it produces leave trails of light in their wake. The detector records these streams of light, enabling physicists to identify the original neutrino and measure the amount of energy it had. When cosmic rays pass through the NOvA detector, they leave straight tracks and deposit well-known amounts of energy. They are great for calibration, said Mat Muether, a Fermilab post-doctoral researcher who has been working on the detector. "Everybody loves cosmic rays for this reason," Muether said. "They are simple and abundant and a perfect tool for tuning up a new detector." 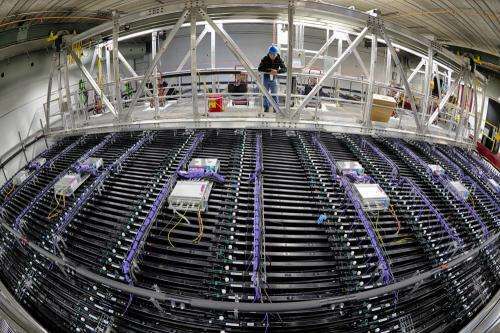 The detector at its current size catches more than 1,000 cosmic rays per second. Naturally occurring neutrinos from cosmic rays, supernovae and the sun stream through the detector at the same time. But the flood of more visible cosmic-ray data makes it difficult to pick them out. Once the upgraded Fermilab neutrino beam starts, the NOvA detector will take data every 1.3 seconds to synchronize with the Fermilab accelerator. Inside this short time window, the burst of neutrinos from Fermilab will be much easier to spot. The NOvA detector will be operated by the University of Minnesota under a cooperative agreement with the U.S. Department of Energy's Office of Science. The NOvA experiment is a collaboration of 180 scientists, technicians and students from 20 universities and laboratories in the U.S and another 14 institutions around the world. The scientists are funded by the U.S. Department of Energy, the National Science Foundation and funding agencies in the Czech Republic, Greece, India, Russia and the United Kingdom. It seems that we have talking a lot about the mysterious neutrino which was told to be one of the fundamental particles. Anyway we still do not clear what it is, is it something like a rigid tiny sphere as an electron or a wave packet of energy like a photon? Maybe this physical mechanism could help to understand it. 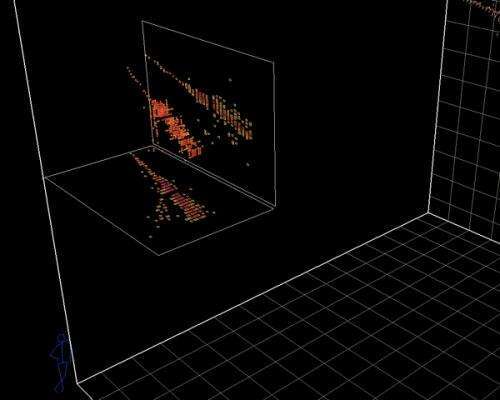 I'd love to see 3D data captured for the famous 'slit experiment'. Neutrinos are too boring. :) vaccum-mechanics, you are such an unsufferable plague on this website aren't you.